The Libraries is inviting all faculty members, students and researchers from the STEM (Science, Technology, Engineering, Mathematics) community to participate in the free training session on Knovel on Thursday, 20 July 2017, 11:00AM to 12:00PM at the AudioVisual Room, The Learning Commons, 13F of Henry Sy Sr. Hall. 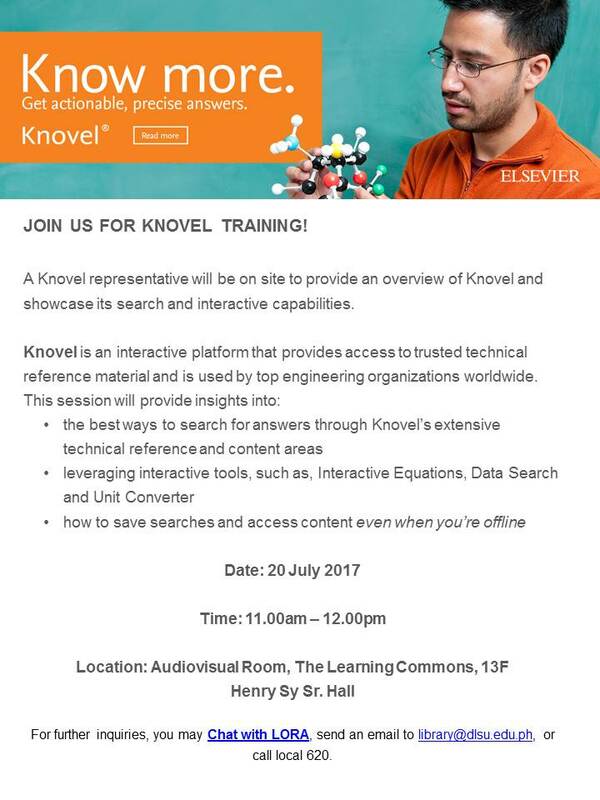 Knovel is a web-based application that integrates trusted technical information with optimized search for engineers and interactive data analysis tools. Interested participants are requested to kindly fill out this Registration Form. Registration ends at 5:00PM on Wednesday, 19 July 2017. Registered participants are kindly requested to bring their laptop/mobile device to facilitate online searching of Knovel, as may be required by the trainor. For further inquiries, you may Chat with LORA, send an email to library@dlsu.edu.ph, or call local 620. Training sessions like this one do not happen often. It is always advised to students and teachers to attend it. I really hope the session be a great help to all the learning participants.